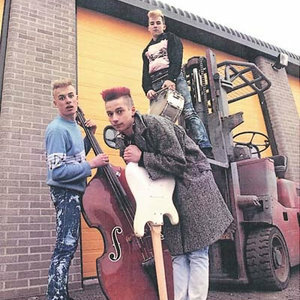 There are more artists with this name: 1) Frenzy are a 3 piece band, formed in the August of 1983, during the successful revival of the Rock-a-Billy music scene around that time. Steve Whitehouse, the founder member of the group, had already found success with his previous two outifts, most notably ' The Sharks ', another 3 piece Rock-a-Billy band who had released an album and various other ditties since their formation in 1981. Indeed, Steve has been actively involved in music since 1980. Citing musical differences, Steve left The Sharks to pursue his destiny with Frenzy. 1) Frenzy are a 3 piece band, formed in the August of 1983, during the successful revival of the Rock-a-Billy music scene around that time. Steve Whitehouse, the founder member of the group, had already found success with his previous two outifts, most notably ' The Sharks ', another 3 piece Rock-a-Billy band who had released an album and various other ditties since their formation in 1981. Indeed, Steve has been actively involved in music since 1980. Citing musical differences, Steve left The Sharks to pursue his destiny with Frenzy. Frenzy came to be in a music shop in Bristol, when Steve and an old friend, Simon Brand, were playing around with guitars and double basses one Saturday afternoon. Steve, 17 at the time, approached Simon about playing guitar and the rest, as they say, is history. Using old contacts and a new demo tape, Frenzy soon clinched an album deal and commenced recording on the first of ten albums to date. Merv Pepler, now of Ozric Tentacles and Eat Static fame, completed the line-up on drums. The 3 piece soon found out they had strong song-writing abilities, creating early anthems like Robot Riot, Hall Of Mirrors, Frenzy, Cry or Die and Sweet Money. The group soon found themselves propelled to the top of their scene. Mostly bypassing support slots, Frenzy became a headlining act within a year of forming, making regular trips to London and other major U.K. cities. On top of all this, the agency that took The Sharks into Europe took Frenzy on, arranging sell-out club dates throughout Holland and Germany. Frenzy's popularity had not gone un-noticed by some of the larger independent record labels, and soon Frenzy had been signed by ID Records in London. The new album, ' Clockwork Toy ', hit the independent charts like a rocket, and the single, ' I See Red ', went Top 10 in 3 weeks. Reaching a high spot of number 3, the single remained in the top 30 for 27 weeks. The album hit Number 8 and stayed there for 6 weeks, during which time Radio 1 picked up on Frenzy's success and played I See Red no less than 21 times. Spun by DJ's such as Janice Long, John Peel, Andy Kershaw, Bruno Brooks and Steve Wright. In a career spanning 20 years, Frenzy have tasted the big time touring the world, reaching places such as Holland, Germany, Finland, France, Italy, Japan, Luxembourg, Belgium, Switzerland and Spain. Radio and T.V. appearances became commonplace, and a deal was signed in Japan for simultaneous releases of Frenzy albums in both Japan and North America. The band has undergone several line-up changes over the years. Musicians have come and gone as they do, and inevitably a little influence of each band member has stayed, making Frenzy a rich mixture of musical cultures. It is safe to say the group still uses the Rock-a-Billy thing as it's foundation, but also Blues, Heavy Rock and Punk can be heard. The music scene has changed but Frenzy are still going strong. In December of 2002, Frenzy released their 10th album, ' Dirty Little Devils ', an album they are most proud of. Twelve classic Frenzy tracks that have received much critical acclaim. The band have not heard a single negative comment from anybody. The whole package is selling like hot cakes. Currently the trio are recording their 11th album, a 21st anniversary special addition cd, and are still making regular trips abroad to headline festivals. Steve Whitehouse has been dubbed ' King of the Slap Bass ' by followers and peers alike, and backs up his playing abilities with a powerful voice and energetic live performance. Steve recently took part in a Terence Higgins Trust Aids Project, which saw him contributing his bass playing to an album which included Sham '69, Sting, Elton John, The Revillo's, The Meteors and many others. Now back with The Sharks as well, Steve say's, " I just can't leave music alone.....it's in the blood, being on stage is what i live for....."
Steve Eaton has been with the band 5 years. He is an accomplished guitarist, who also plays for Punk outfit ' Far-Cue '. Steve has played for a number of different styled bands, which has given him a rich insight into a variety of different techniques. His input into Frenzy is invaluble. On stage he is a man possessed, and off stage has struck up a great song-writing partnership with Steve Whitehouse. Rob Chapman has been playing drums for 17 years and comes from a varied musical background. He has played Soul, Rock n Roll, and Heavy Rock with his last venture before joining Frenzy, being part of a comedy trio, ' Stumpy, Ginge and Tubs ', a skillful musical unit who were much in demand. Rob has been a member of Frenzy since May 2002, and as well as being a solid player, provides much welcomed comic relief whilst on the road. 2) Japanese Frenzy, the solo project of Mr.SaTaN. See unicode tag ????? ?.